For the dough, beat the butter and confectioners’ sugar with an electric mixer fitted the paddle attachment on medium speed until soft and light, 2 to 3 minutes. Beat in the ground walnuts. Remove the bowl from the mixer and stir in the flour with a large rubber spatula, mixing until the dough is smooth. Scrape the dough out onto a lightly floured work surface and divide it into 3 parts. Flour the surface and the dough and gently roll it to about 1/4-inch thick. Use a plain cutter to cut out 2- to 2 1/2-inch cookies and place them on the prepared pans 1 inch apart in all directions. Incorporate the scraps from the first piece of dough into the second and roll and cut more cookie bases. Bake the cookie bases until they are very light golden in color, about 15 to 20 minutes. Change the position of the pans from upper to lower rack and vice versa, also turning them back to front at least once during baking. If your oven gives strong bottom heat, stack 2 pans together for baking on the lower rack to provide insulation against burning the cookies. Cool the cookies on the pans on racks. Meanwhile, place the preserves in a medium saucepan and bring them to a boil over low to medium heat, stirring occasionally. After the preserves boil, lower to a steady simmer and allow them to reduce for about 5 minutes, or until slightly sticky and no longer watery. Turn half the cookies upside down so that the flat bottom sides face upward. Put about 1/2 teaspoon of the reduced jam on one of the cookies and top it with another cookie, flat side down. Continue until all the cookies have been sandwiched with the preserves. For the glaze, stir together the water and corn syrup in a medium saucepan and then stir in the sugar. Bring the syrup to a full rolling boil over medium heat, stirring occasionally. Remove from the heat, add the chocolate, and swirl the pan to submerge it. Let the glaze stand for 3 minutes. Meanwhile, line up all the sandwiched cookies close together on a piece of parchment paper (you can reuse the paper they were baked on). Whisk the glaze smooth, then pour some into a paper cone or a non-pleated plastic bag. Whether cone or bag, snip the end and drizzle the glaze over the cookies in straight lines. Continue until you have used all the glaze. 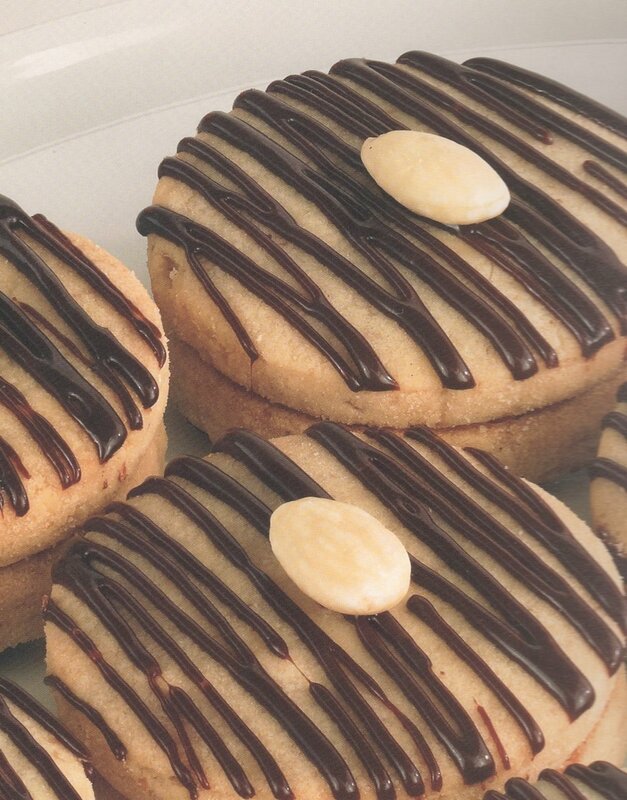 While the glaze is still wet, gently press an almond into the center of each cookie.